• U.S. Tax Court — The majority of cases are heard in Tax Court, before a judge with expertise in tax law. Small tax cases ($50,000 or less) can be handled in an expedited, less formal procedure, but those decisions cannot be appealed. • U.S. District Court — Taxpayers must exhaust all administrative IRS remedies and pay the disputed tax before seeking a District Court remedy (refund). While this venue offers the only opportunity for a jury trial, judges may not be versed in the intricacies of tax law. • U.S. Bankruptcy Court — If the taxpayer has filed for Chapter 7, Chapter 11 or Chapter 13 bankruptcy, a Bankruptcy Court judge can rule on (a) whether IRS deficiency claims and IRS tax liens are valid and (b) whether upheld tax liabilities can be discharged. • U.S. Court of Federal Claims — This is usually the domain for substantial tax claims brought by large corporations. The company pays the tax and then sues for refund of the disputed amount. 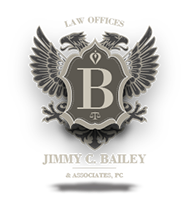 As your Advocate, Jimmy C. Bailey & Associates, P. C. is committed to resolving your tax-related legal problems in a favorable manner.